Called BeeScanning this app on Kickstarter uses crowdsourcing and deep learning to help with the disappearing bee problem. Bees are an essential element of modern society. Their pollination efforts are what make it possible for farmers to raise plants and crops. Unfortunately for beekeepers, it’s often difficult to spot parasites which threaten their bees.The makers of BeeScanning are looking to simplify infection identification with their beekeeping app designed to aid beekeepers in finding said parasites. BeeScanning works by helping to identify the mites in the images and then enabling the beekeeper to determine whether to treat or not treat the bees. 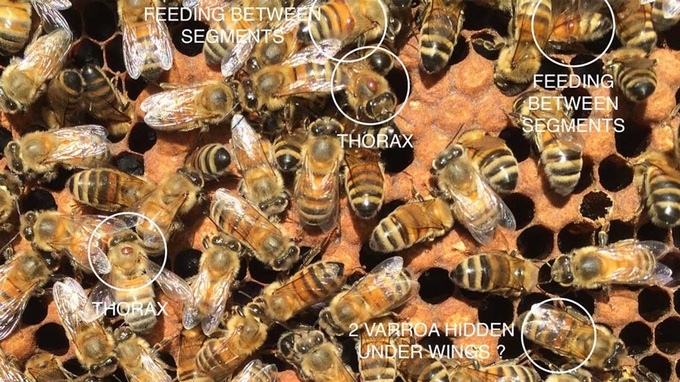 A few of the signs the app looks for include varroa on the side, deformed wings, decapped brood, and punctuated cellocks. The app functionality enables users to scan for infestations, view the settings, select contacts, search for information, and more. The makers of BeeScanning are planning to store images and data from the beekeepers. The image analyzing technology is based on cutting-edge neural networks and deep learning. In order to develop these databases, the makers are collecting pictures and survey data taken from 10,000 colonies and contributed by beekeepers worldwide. During the development process of the beekeeping app, the correlation between how the bees perform, what crop they bring, and how they survive is used for the software development. The makers of the app then compare received data with their own controlled extended survey where alcohol washing is used as a benchmark to measure the infestation. The neural network is taught by a deep learning professional who has access to a wealth of training data. In order to develop the system, a process of trial and error is used. By repeating the process several thousand times the system is able to become precise to the point that it’s better than a human at identifying infections. As far as the founding team goes, the team members have over 15 years of experience developing complex systems. Led by Emil Romanus, a professional involved with the development of the 3D simulation game “Apparatus,” the team has been focusing heavily on deep learning for the past few years. Additionally, they’ve made several large investments in the hardware required for these systems to function. So far the makers of BeeScanning have raised over $6,000 via crowdfunding with an estimated shipping date of June 2017. While that might sound like much, the major assets for the program (about $350,000) are expected to be funded by the European Innovation Program. It is a couple of months passed June and I just took a look at the campaign link that you shared. Would it matter the type of camera your phone has? I have been reading a lot more about helping the bee community. I really want my yard to help them out in the end and I think this application is a great addition to being able to do that. We hear about how the bees can control an entire planet, so with an app like this, one would assume that the bee population would get bigger and healthier, right? IT is nice to see an app or product of this kind get funded. A very noble cause! We read so much information regarding the bee situation in the United States and here is a company that is hoping to help things out a little. I know, it’s so sad, right? Bees are essential to the survival of a lot of things. Including people. Being able to spot disease and things like that can save a lot of time and money in the industry! Not only is the app a really good idea, being able to store those images and data HAS to be helpful for the community as a whole. There is a lot of talk about this app among the beekeepers that I know! Really!? I am not even sure I know a single beekeeper! Wow, in a world where there is news about bees dying off and things like that, this application is apparently the best thing to have for beekeepers. I am impressed. Beekeepers all over the country are like, “what?” 🙂 I really like the idea and am equally impressed as you are. I just question the accuracy.